Last weekend, I went to see the Queen again! Unfortunately, not only was she out for the day, but she had taken some of the things I had gone to look at. But being the Queen, she can do as she darn well pleases, of course. After writing only recently about King Edward VII’s famous love of horseless carriages, I thought it was time to look at something a little less newfangled. 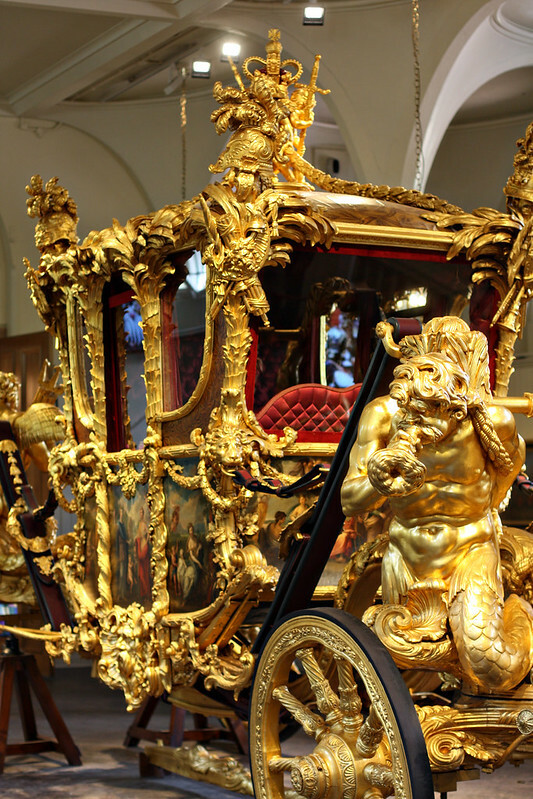 Come with me on a stroll through the Royal Mews and look at some fancy-pants coaches… the kind that come WITH horses! It’s fair to say that the Royal Family like a good carriage. King Edward VII was a huge fan of carriages, horseless carriages AND a good undercarriage… sorry, maybe that’s a bit crude. On any given state occasion, the whole family will get to ride in one of the many snazzy carriages at their disposal. The most famous and definitely the jazziest of all is the Gold State Coach. 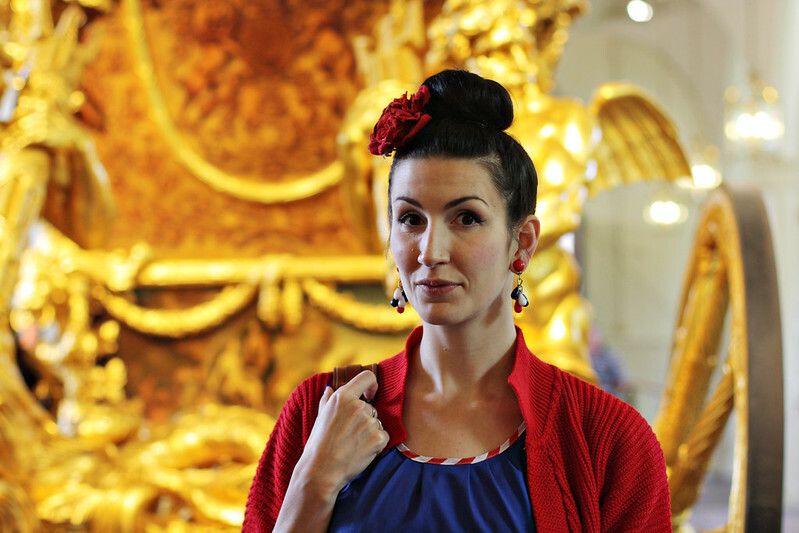 Yes, that’s real gold leaf. 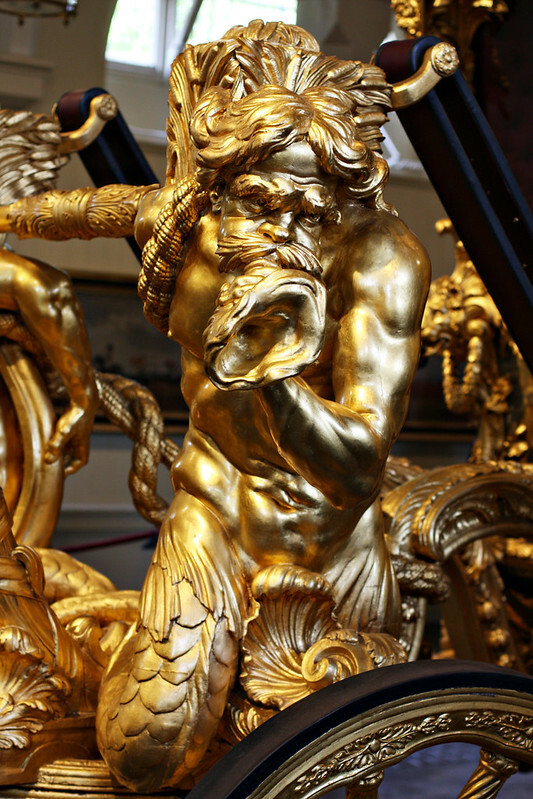 It’s a four-ton beast that was ordered by the 24 year old King George III in 1760. His precise order was for a ‘very superb’ State coach for his wedding. They missed their deadline by rather a lot, and George rode in it to the State Opening of Parliament in 1762. 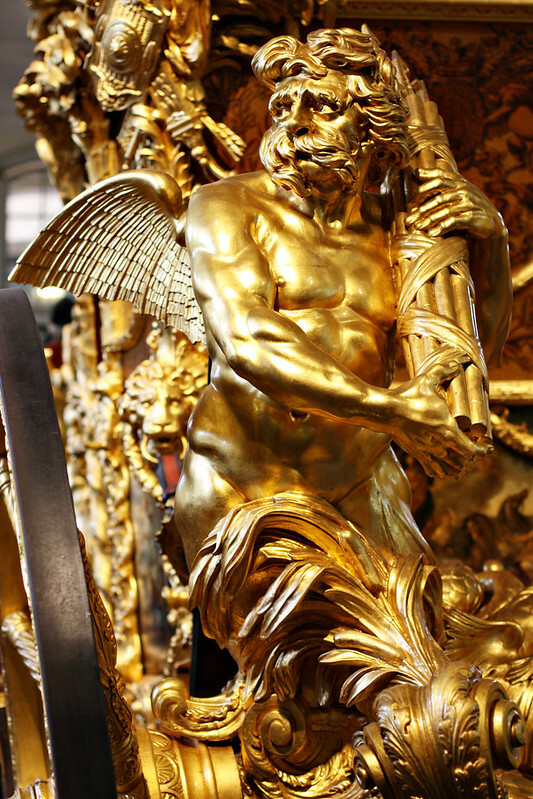 The people loved its glittering opulence, its cherubs, crowns, palm trees, lions’ heads, faces, tritons and dolphins. And what opulence? It cost an astonishing £8,000 which amounts to nearly 16 million quid in today’s money. Luckily, it’s proved to be fairly good value, as it’s been used at the coronations of every British monarch since. Here’s Queenie in it in 1953, the first time it had ever been seen on TV! And here’s our hero in it at his own coronation, over 150 years earlier, in 1902. Not all the Kings and Queens who’ve had the honour of riding in the Gold State Coach have had nice things to say about it. William IV compared it to being aboard a ship in rough seas and Queen Victoria apparently refused to ride in it, due to its ‘distressing oscillations’! Only our present queen has benefited from the wheel upgrade it was given after WWII… some air cushioning is now present! Side note – it’s so bright, it throws everything into shadow! Anyway, back to the Mews. There are over 100 coaches and carriages belonging to the Royal Family around the place, but only a selection of them are on display. 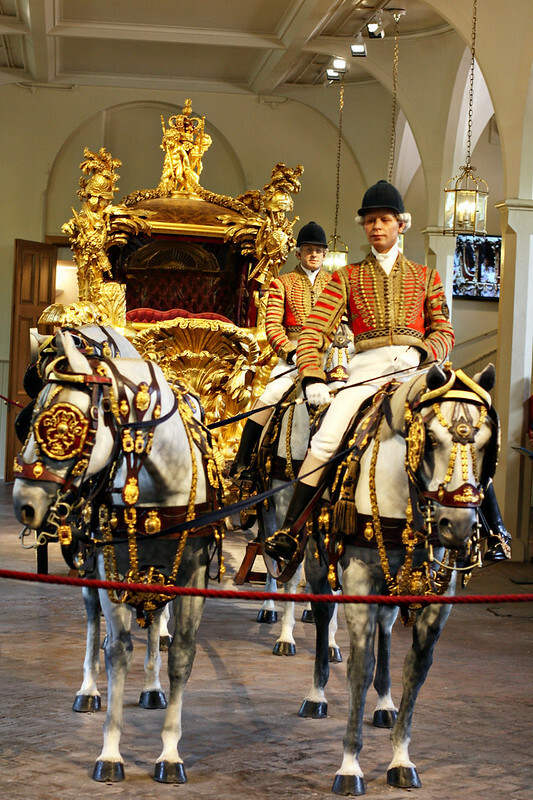 Many date from the Victorian era, up to 1988, when the last adddition, the Australian Coach was presented to her Maj. The one I had really come to see though, was the 1902 State Landau, ordered by and built for King Edward VII himself, for his coronation in 1902. 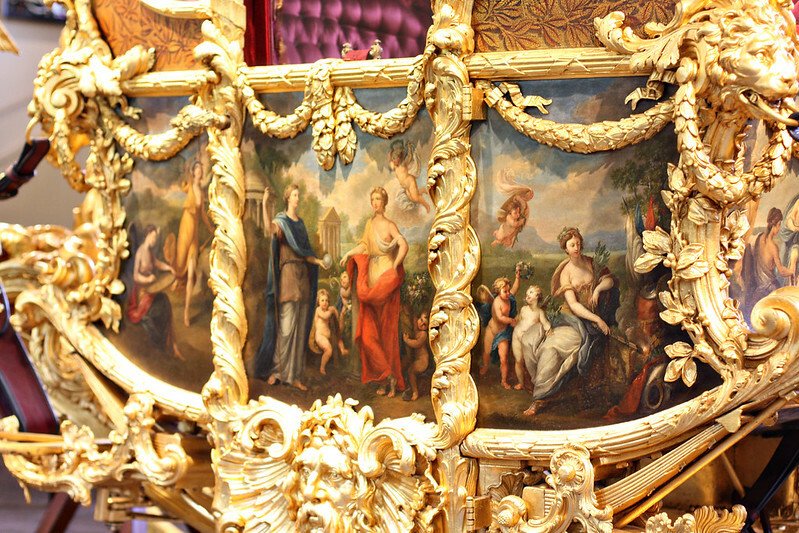 Of course, this was the carriage being used by the Queen on the day I visited, along with all the horses! Darn it. The 1902 State Landau is the one that was used at Prince William and Kate Middleton’s wedding, three years ago this month. But when it was ordered, the Hooper coachbuilding company took into account the king’s large girth when it was constructed, making sure he would be able to get in and out easily and sit in comfort with Queen Alexandra by his side. It starred in a 1902 edition of the Black and White, but I think artistic licence was used in lieu of an actual visit to draw it… since as we can clearly see above, the landau doesn’t have a roof! Pulled by four horses, with two postilions, or riders, on the front pair, it also took Charles and Diana to Buckingham Palace after their wedding, as well as Wills and Kate. Unfortunately, since Bertie was the one who had it made, and every time its pictured they mention that, it’s hard to find a photo of him riding in it! There are lots of the Queen, Queen Mother, Camilla, Charles & Diana and Wills and Kate plus many more. I found this photo of Edward VII’s son, George V in an open coach, but I think it is a different one, with a much less snazzy paint job. This postcard from 1908 shows King Edward on a Royal Procession to Ascot, for the races. The photo was actually taken the previous year as he rode to Ascot 1907 in what looks like the same carriage as his son in the photo above. History detective, I am. On Wednesday 23rd June 1909, the King visited Gloucester (the first monarch to do so since the Mad King George III) and he apparently went in his 1902 State Landau! I found this fabulous photo, taken by a visiting Government photographer from Queensland, and some info about it here (side note, we didn’t get a day off in my school when the Queen Mum came to visit, no fair). 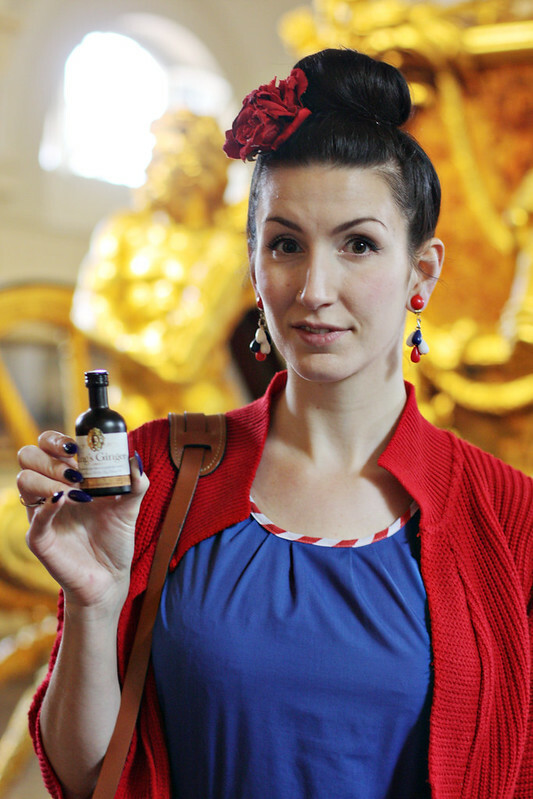 The other relevant carriage in the Royal Mews is the one known as Queen Alexandra’s State Coach. 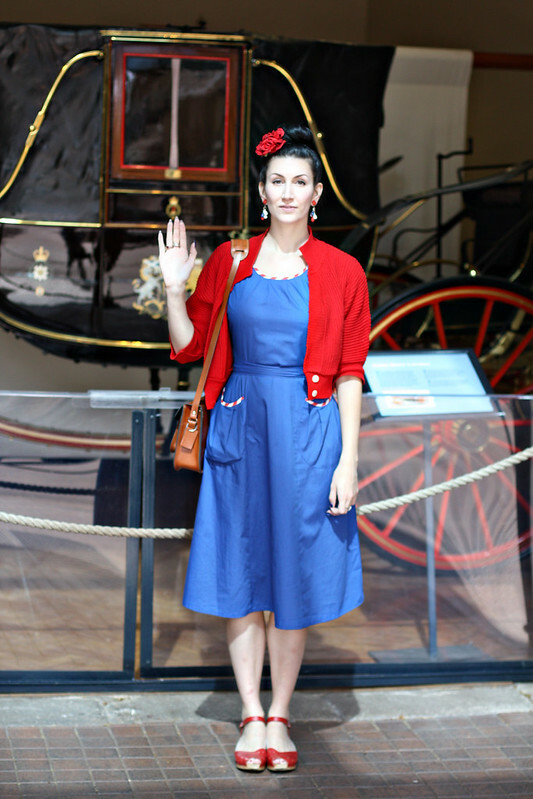 Patriotic Fleur dress was the only option, really. This is a coach that was a plain old thing, built during Victoria’s reign, but reconditioned, glazed and jazzed up for the then Princess of Wales, soon to be Queen Alexandra in the 1890s. Its main duty these days is to carry the Crown Jewels, including the Imperial State Crown and the Queen’s parliamentary regalia from Westminster to the State Opening of Parliament. It’s nowhere near as ostentatious as the Gold Coach, nor the Irish State Coach (which was destroyed by a fire shortly after King Edward’s death… here it is just for interest) OR Queen’s latest addition, the Australian Coach, which is so modern, it actually has electric windows! The Irish one… Gold on the roof! But… the Aussie one has electric windows you guys! A most poignant note to end this blog upon has to do with King Edward VII’s final journey. I did a piece last year on his final train journey on the Necropolis Railway, but his very last procession through London was by carriage. For his State Funeral in 1910, the King himself was carried upon a gun carriage, which seems pretty appropriate to me. And the Queen, now the Queen Mother, followed behind in her State Coach. He may have been an advocate of the horseless carriage, but in the end, it was in supreme tradition that the King’s reign ended. Talking of drink, The Twinger is my King’s Ginger cocktail of the month, a fittingly golden colour to match the Gold State Coach, and refreshing in this changeable weather we’re having! If you want to try it, have a look out in Waitrose, loads of amazing bars or any of the places listed here and let me know if you do! Wowzers that golden carriage requires sunglasses! 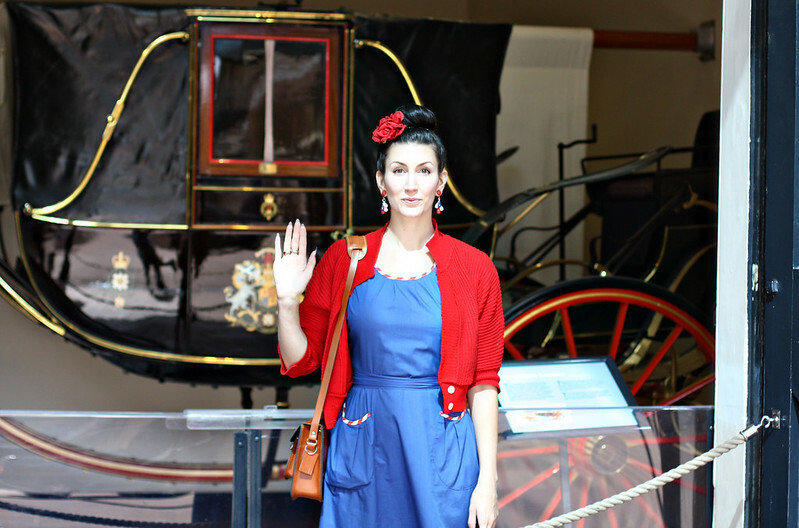 Love the history and all those pictures, I love me a carriage too! I love reading these historical posts! It looks like the landau is a convertible. They must have drawn it with the roof up. Wonderful post and can I say awesome nails? ?